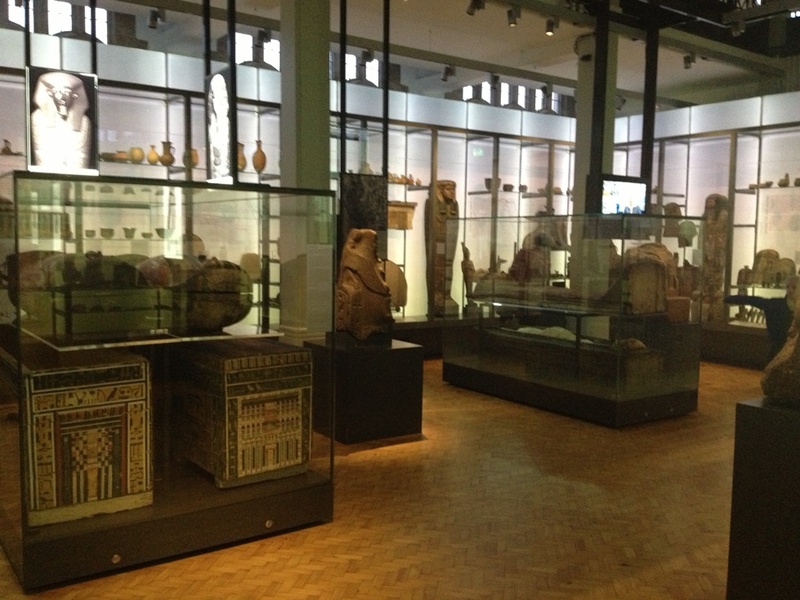 View of Egyptian Worlds gallery. The Ancient Worlds galleries opened on the 30th November 2012, marking the 100th anniversary of the first Egyptian gallery at Manchester Museum. As I toured the new galleries with the Curator of Egypt and the Sudan, Dr Campbell Price, it was amazing to see the difference since my last visit in 2009. Even though there are more objects on display than ever before, the galleries feel lighter, more spacious and as a result more inviting and engaging. 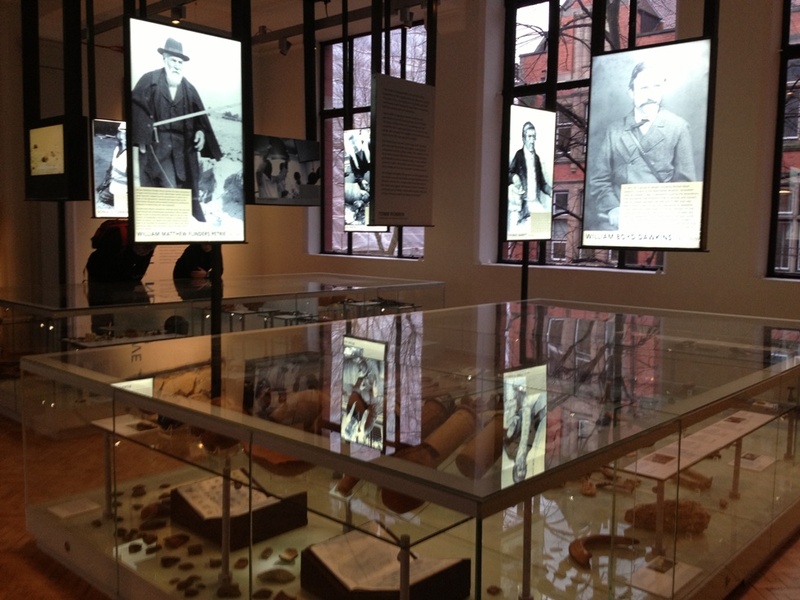 View of Discovering Archaeology gallery with image of Flinders Petrie. The first of three galleries, Discovering Archaeology, contextualises the collection by exploring our relationship with the past – presenting archaeology as a means of “defining and exploring a sense of place, community and identity.” Focussing on the human stories behind the collection the gallery introduces key figures from across the breadth of the discipline and its history, with topics including Early Collecting, Theoretical Archaeology, Understanding Materials and Public Archaeology. The gallery presents a completely holistic and analytical view of current archaeology with a focus on Manchester’s contribution to the study, care and display of archaeological objects. Discovering Archaeology has allowed the Museum to display a greater range from their extensive archaeology collection. From an Egyptology perspective this gallery places Egypt within a global archaeological context and provides a greater understanding of Egyptian archaeology’s role within the development of the discipline. 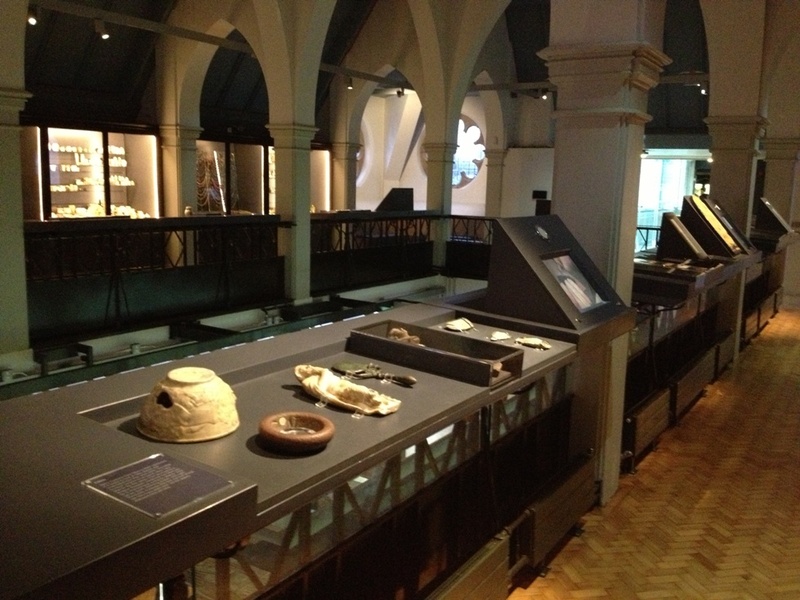 Within this gallery ancient Egypt is primarily represented through Flinders Petrie in a discussion of sequence dating, ‘setting standards in archaeology’ and his connection to Manchester beneficiary and collector Jesse Haworth. View of the Egyptian Worlds gallery. 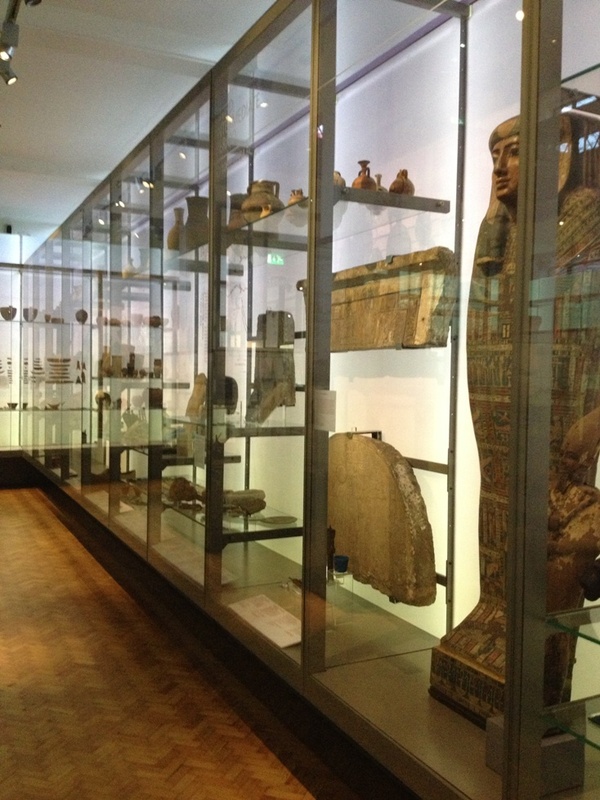 The Egyptian Worlds gallery maintains that same feeling of space and light. Around the outside of the gallery objects are arranged in chronological order, displayed in cases with back-lit panels designed to project the subtle shades of an Egyptian sunrise and sunset. Beginning with Predynastic Egypt, on either side of the entranceway, and culminating with the Late Period and Late Antiquity, the Egyptian chronology runs parallel down both sides of the gallery allowing the visitor to create their own pathway. As part of this arrangement the Museum has displayed a selection of pottery from each period running around the top of the cases – a display technique that creates open storage and presents a unique visual demonstration of the development of pottery throughout Egyptian history, signifying its importance and consistency as an archaeological find. The gallery explores each period and its objects through a wide range of themes and sub-themes presented through varying layers of interpretation, from large back-lit text panels, to object labels and case labels on the glass. 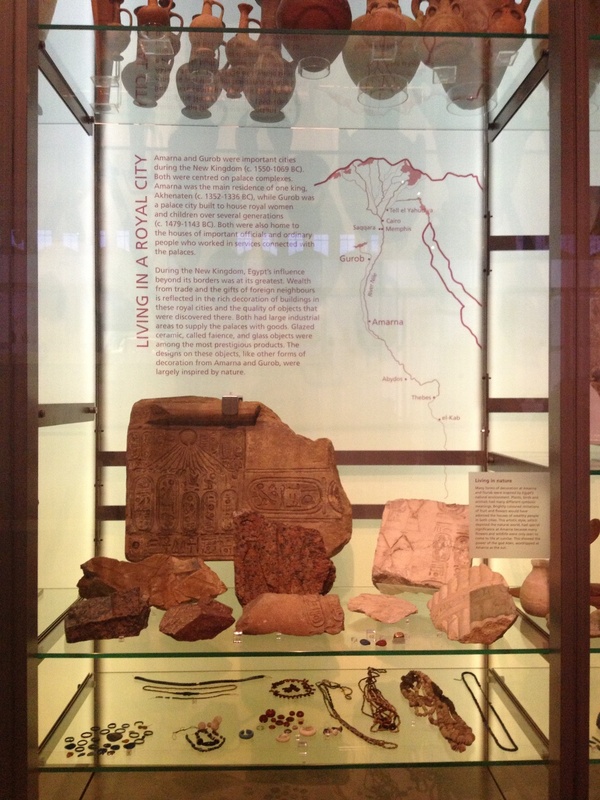 The new display really showcases Manchester Museum’s extensive collection of daily life objects, using the sites of Kahun, Gurob and Amarna to represent the ancient Egyptian lived experience during different periods. The wider themes and objects chosen have also created a wonderful sense of diversity within the gallery, creating a celebration of the different cultures and religions that have been, and continue to be, a part of Egypt. Furthermore this focus on cultural interaction serves to centre ancient Egypt geographically in relation to its neighbours. Amarna – Living in a Royal City. Framed by this chronological arrangement the centre of the gallery showcases larger freestanding objects, detailing object stories and interpretations in greater depth. However it is the display and discussion of the mummy and coffin of Asru in this area that is of particular interest. Manchester Museum has a strong historic connection with the study of ancient Egyptian human remains and Dr Price explained how he was keen to reflect this in the new gallery. While the number of human remains on display has decreased, the focus on Asru has allowed the Museum to properly contextualise her display by examining the scientific study of human remains in greater detail. It was interesting to hear about how much of Asru’s display was introduced as a result of extensive audience research at development stages. The covering of Asru from neck to ankle in ancient fabric, the patterned glass to distinguish cases that contain human remains and the use of soft lighting on a motion sensor all contribute to a more ethically-aware style of display. This approach has been strengthened by the inclusion of an interview with Professor Rosalie David from the Manchester Mummy Research Project explaining more about the life of Asru and the value of scientific investigation. These elements have contributed to a subtle yet powerful and thought-provoking display – a sentiment that is continued in the Fayum Portrait Room, a dark and tranquil side-room that allows you to consider the people behind the ‘mummy masks’. View of Exploring Objects gallery. Exploring Objects, the third and final gallery in the series, challenges the way we view and interpret collections – situated on the balcony overlooking Egyptian Worlds this space is ideal for thinking beyond the museum display and contemplating the objects below. The gallery provides a new and exciting way of questioning museum and archaeological processes through themed display windows, hands-on activities and digital interactives, using the ancient Egyptian collection to explore museum approaches to conservation, classification and collecting. The most eye-catching displays in this gallery are the mass collections – high density displays of objects organised by type, including jewellery, shabtis and stone vessels. It was great to hear from Dr Price how the mass displays were incorporated by the Museum as a direct result of community responses and the public’s desire to see more of the collection on display. The Museum has provided some excellent ways of engaging with the collection. In addition to an object handling area and i-pads to access the Museum’s blog content, each gallery features audio-visual points where visitors can watch interviews with leading professionals in the field, allowing visitors to participate in current debates and interpretations. There is also an Ancient Worlds Mobile Experience that enables you to unlock fantastic additional content about the objects on display, including audio commentaries, interactive 3D models and image galleries, using your smartphone and the Museum’s free wifi. A big thank you to Dr Campbell Price for giving up his time and providing such a brilliant guided tour. Don’t forget you can follow the work of Dr Price on Twitter and through the Egypt at the Manchester Museum blog. Mass display of shabtis in Exploring Objects gallery. ← The Petrie Museum on Tour, London.